Become LT2 Compliant – Removal of Cryptosporidium & Giardia lamblia - LT2 "Long Term 2 Enhanced Surface Water Treatment Rule - GUDI" Ground Water Under the Direct Influence of Surface Water. NSF 61, 1u absolute media, 3.6 log reduction of cyst sized particles. What is Long Term 2 Enhanced Surface Water Treatment Rule (LT2 Rule)? The EPA has developed the LT2 ESWTR (LT2 Rule) to improve your drinking water quality and provide additional protection from disease-causing microorganisms and contaminants. Why is the EPA concerned about Cryptosporidium? Cryptosporidium is a significant concern in drinking water because it contaminates most drinking water sources, it is resistant to chlorine and other disinfectants, and has caused waterborne disease outbreaks. Consuming water with Cryptosporidium can cause gastrointestinal illness which may be severe and sometimes fatal for people with weakened immune systems including infants and the elderly. The EPA estimates that full compliance with LT2 ESWTR will reduce the incidence of cryptosporidiosis by 89,000 to 1,459,000 cases per year, with an associated reduction of 20 to 314 premature deaths. The LT2 ESWTR applies to all public water systems that use surface water, or ground water under the direct influence of surface water. This includes about 14,000 systems serving approximately 180 million people. 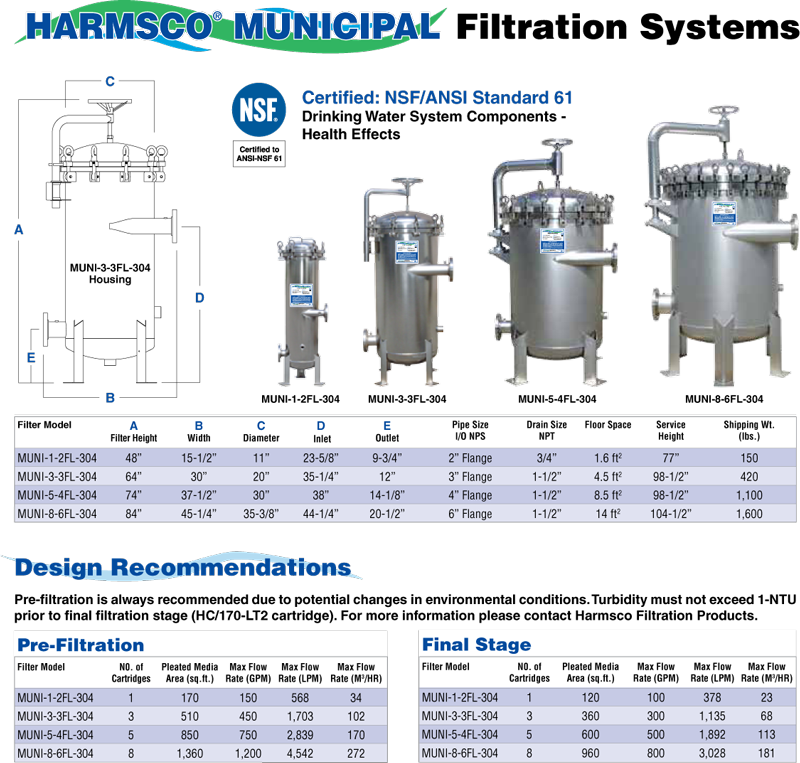 All components used in drinking water treatment process should be evaluated for contami- nant leaching and Certified under ANSI/NSF Standard 61. Full scale filter testing, challenge particulate, test solution concentration, challenge test duration, water quality of test solution, maximum design flow rate, challenge particulate seeding method and concentration, sampling procedures and calculation of log removal. Up to 2.0-log removal for individual cartridge filters showing a minimum of 3.0-log removal in challenge testing. Up to 2.5-log removal for cartridge filters in series showing a minimum of 3.0-log removal in challenge testing. 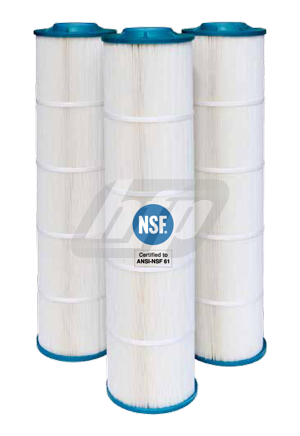 A minimum of two (2) bag or cartridge filter housings should be provided to ensure continuous water treatment in the event of failure in the filter operation and to allow for filter maintenance and replacement. Harmsco® LT2 cartridges and housings exceed the three-log (99.9%) removal requirement described in LT2 ESWTR Toolbox Guidance Manual 8.4.1. for cyst-sized particles. For this reason, Harmsco® LT2 filter cartridge elements are ideal to control cryptosporidium, giardia cysts and other harmful microorganisms to help ensure safe drinking water. To verify the performance of the Harmsco® LT2 cartridge and NSF filter housing, Pace/IBR, highly respected independent testing facilities, were selected to conduct challenge tests as outlined in the LT2 ESWTR Toolbox Guidance Manual 8.4.1. This defines the maximum challenge particulate based on detection limit and acceptable cryptosporidium surrogate…2 microns in these tests. 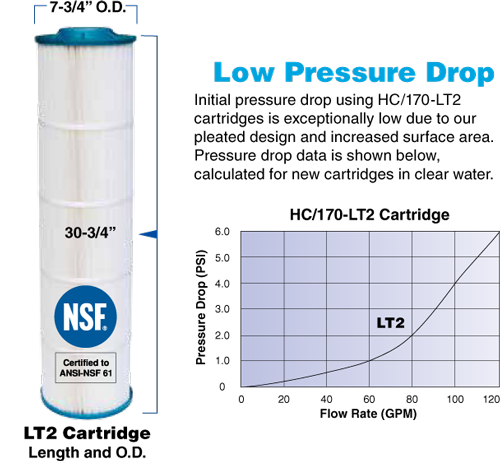 The "terminal" pressure drop was determined by Harmsco® to be 30 psi. The Harmsco® LT2 cartridges were tested via single pass protocol per the EPA at 3 separate points: 1.) after initial flushing (clean cartridge), 2.) at 50% of terminal pressure drop (15 psid) and 3.) after terminal pressure loss has been reached (30 psid). * Temperature limits vary and depend on pressure and time under load. Dimensions: 7-3/4” O.D. ; 4” I.D. ; 30-3/4” L.
* Temperature ratings based on pressure and time under load.